Atlanta – Peachtree Publishing Company Inc. The spirit of Atlanta is captured this lavish collection of more than 200 breathtaking color photographs. This updated edition combines gorgeous views of ever-changing Atlanta with vignettes that chronicle the history of the city and some of its most influential citizens. For the research-minded reader, the book provides extensive background information on each photograph and an anecdotal index which tells the stories behind the pictures. 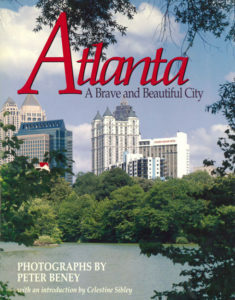 Peter Beney published numerous books of his photographs, including Beautiful Georgia; Atlanta: A Brave and Beautiful City; and Beautiful Atlanta. He lives in Georgia.